We are committed to continuously improving access to our goods and services by individuals with disabilities. This website is currently being updated to enhance the usability and experience for persons with disabilities. If you are unable to use any aspect of this website because of a disability, please call 603.890.4004 for Salem or 978.358.8576 for Newburyport and we will provide you with prompt personalized assistance. In most cases, Artisan Dentistry can complete your root canal in just one visit with less anxiety than for prolonged procedures. Endodontics is a specialized branch of dentistry that looks at the tissue surrounding the tooth and the tooth pulp, which contains the nerves. When a tooth is injured or begins to severely decay, endodontic treatment is required. Endodontic treatment may require endodontic therapy, or a root canal. These two words conjure up dread in many dental patients. Understanding the procedure is the first way to allay any fears. Root canals used to always take more than one visit to the dentist and often prolong the patient’s anxiety. 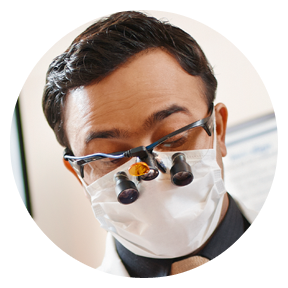 In most cases, Dr. Mathew can complete this procedure in only one visit. A root canal may also be the only way to restore the tooth to a healthy state. The center of the tooth has a natural cavity containing the pulp, main root canals and branches that connect the canals to one another. Sometimes the pulp becomes inflamed or infected due to fractures, damage, or decay of the tooth. This may carry bacteria to the root canal. A root canal removes the infected tissue. After the patient is anesthetized, the damaged portion of the tooth is painlessly removed. It is important to remove all the bacterial infection during this process. The canals of the tooth are cleaned out using a file, and the tooth is irrigated to clear and neutralize any remaining tissue. Once the tooth has been hollowed out, it is filled, usually with a rubbery substance called gutta-percha, and then capped with a crown. The crown will keep the tooth from fracturing, or being otherwise damaged again. Root canals are an effective and sometimes are the only way to clear the bacterial infection from the tooth. An infected tooth will not heal on its own, so it is important that you see your dentist as soon as possible if you believe you have an infection and may need a root canal. If you would like to learn more about endodontics or schedule a consultation, please contact Dr. Mathew today! When a tooth is injured or begins to severely decay, endodontic treatment is required, which may include root canal therapy. Anyone can train to be a technician, but few have the talent to become an artist. That’s why Dr. Mathew is able to guarantee his cosmetic dentistry work for a full 5 years. If anything goes wrong with the work, Dr. Mathew will fix it free of charge, as long as you continue with your regular 6 month preventative care cleaning and check up for the duration of the warranty. Our individualized treatment rooms and operatories provide patients with maximum privacy and comfort. The treatment rooms were built specifically with your comfort in mind. Here at Paul Mathew, D.D.S. we work diligently to protect our patients' privacy. Requesting an appointment via our Internet portal is considered part of what the Health Insurance Portability and Accountability Act (HIPAA) has identified as electronically protected healthcare information or ePHI. Unfortunately, despite our best efforts, there are people or entities that may attempt to intercept the data you transmit to us. By checking the "I agree" box, and electronically making an appointment request, you acknowledge that you are making an appointment over the internet and that Paul Mathew, D.D.S. will keep this information confidential but cannot guarantee that others, outside of our practice, may illegally intercept this communication. By accepting these terms and conditions and sending this request via our Internet portal, you accept the inherent risk(s) associated with making this request for an appointment. If you do not accept the terms and conditions, you are always welcome to contact our office via telephone to schedule your appointment.